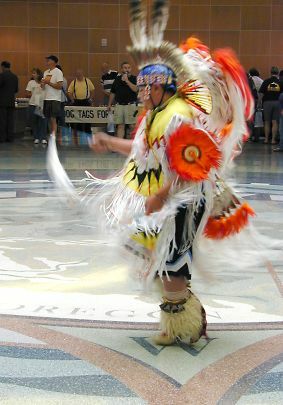 From my point of view, the highlight of the event was the Shoshone-Paiute tribe's youth dancers and the Little Eagle Tail drum. Most of the crowd wandered around oblivious (and some wandered through), but for those paying attention, the building and the beautiful tile mosaic were getting the blessing of the people who were here first, with their own lively art. It felt good, it looked good, and it sounded good.